On average the cost of renting a property in Germany rose by 4.8% last year. They have also risen by a total of 13.2% in the last five years. However the level by which rents were increased depends a lot on where you live in the country. In Berlin rents have actually increased by over 25% in the last five years. 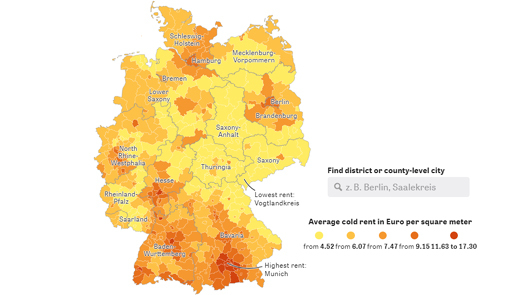 Zeit Online has released an interactive map which shows the average cold rent (no heating, water or other utilities included in the rent) cost per square metre in every district in Germany. If you mouse-over a district on the map you view the number of Euros it costs to rent in the district and the percentage that rent has risen (or fallen) in the last five years. Munich is the most expensive place to rent a property in Germany. On average it costs 17.30 Euros per square metre to rent property in the city. The cheapest place to rent is in Vogtlandkreis. Renting in Vogtlandkreis will only cost you around 4.52 Euros on average. If you want to rent a property in Berlin then you might want to refer to another interactive map. The Berliner Morgenpost's map of Berlin rent allows residents to see how much of their monthly income they will have to spend (on average) when renting a property in the German capital. Wo Sie sich Berlin Leisten Können uses a sliding income control to allow users to enter their monthly income. The income control generates a heat map of Berlin that shows what percentage of the entered monthly income will on average go on rental costs in the city's neighborhoods. It is also possible to enter the number of bedrooms your require in order to adjust the map to show the rental costs for different sized apartments.